Lord Wulf von Dunstig is in deep trouble. He is surrounded by invading enemies and kingdoms fallen into chaos. Along with dealing with the problems of a realm he never expected to rule, Wulf is in love with the elf maiden Saeunn Amberstone. Saeunn once saved his land. Now she has lost her star-soul and is dying. Ursel Keiler wishes she could control her errant heart as easily as she can guide the flight of an arrow to a target. She tries to escapes into the woodlands she adores, only to be pulled back by a band of desperate and brave warriors who need her help. But aiding them will lead Ursel straight to Wulf von Dunstig, and to the heartache she is fleeing. Yet evil cares nothing for human feelings. Now Wulf, Ursel and their friends must find a way to unite the land of Shenandoah against a powerful Roman inquisitor. He not only controls an Imperial Legion, he is also toying with magic that threatens the foundations of existence itself. Yet there is hope even in the deepest and darkest places of the world, and all may depend upon Wulf and Ursel forging a powerful weapon drawn from the heart of a dragon. 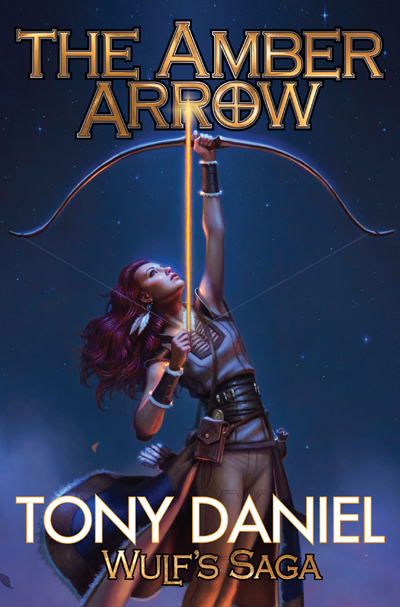 Tony Daniel is the author of nine science fiction books, the latest of which are Guardian of Night and The Dragon Hammer, as well as an award-winning short story collection, The Robot’s Twilight Companion. He is the co-author, with David Drake, of General series entries The Heretic and The Savior. He is also the author of Star Trek Original Series novels Devil’s Bargain and Savage Trade. Daniel is a Hugo finalist for his story “Life on the Moon,” which also won the Asimov’s Reader’s Choice Award. Daniel’s short fiction has been much anthologized and has been collected in multiple year’s best compilations. Daniel has also cowritten screenplays for SyFy Channel and the Chiller Channel. During the early 2000s, he was the writer and director of numerous audio dramas for critically-acclaimed SCIFI.COM’s Seeing Ear Theatre. Born in Alabama, Daniel has lived in St. Louis, Los Angeles, Seattle, Prague, and New York City. He now lives in Wake Forest, North Carolina with his wife and two children.